The next film by the filmmaker Antoine Fuqua, 'The Equalizer 2', is the sequel to the film released in 2014 'The Equalizer', and the first in the film career of Denzel Washington, who plays the leading role in this second project. It is scheduled to premiere in the United States next July 20th, 2018, and introduces us to the story of Robert McCall (Denzel Washington), who after discovering that his friend Susan has been murdered, will decide to return to his old ways and seek out those who committed the crime. Richard Wenk is responsible for the script of the film and the cast is completed by Ashton Sanders, Pedro Pascal, Jonathan Scarfe, Sakina Jaffrey, Melissa Leo, Bill Pullman and Eminem. 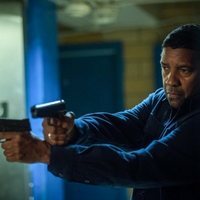 NBA 'The Equalizer 2' Spot: "Denzel is Back"
Write your own 'The Equalizer 2' review. After over 55 film and television credits, this will be Denzel Washington's first sequel. Two security guards were wounded during a shooting which took place during the film's production. During filming, the crew whimsically referred to it as "The Sequelizer."